As a senior at Valpo, Holly Buckman wrestled with a momentous decision — whether or not to enroll in a Ph.D. program in clinical psychology. She enjoyed her undergraduate work at Valpo, but was she ready to invest the next several years of her life in an advanced degree? Just as the critical decision point approached, Holly traveled to the annual meeting of the American Psychology-Law Society in New Orleans. With two other Valpo students and Amanda Zelechoski, J.D., Ph.D., a member of the psychology faculty, she presented preliminary findings of her cross-cultural comparison of stress on police officers in the United States and the United Kingdom. After the conference, Holly arrived at her decision: she accepted an offer of admission to the Ph.D. program in clinical psychology at Palo Alto University in Palo Alto, Calif. There are many career paths open to a psychology major at Valpo, she says. Holly, who hails from North Judson, Ind., graduated from Valpo with a double major in psychology and sociology with a concentration in criminal justice. Interested in the intersection of psychology with criminal justice, she plans to concentrate her studies in forensic psychology. She’s had numerous opportunities to explore aspects of the field during her career at Valpo. Research opportunities in the Department of Psychology were plentiful, Holly notes. “Because the class sizes are small, you know the professors very well, and it’s easy to approach them to ask if they need research assistants. The department also offers research classes that give you a little more support from professors than independent research. 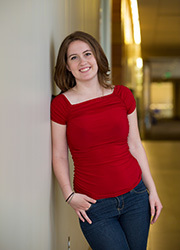 And it’s been great to work alongside graduate students,” says Holly. “I’ve done research with Professor Zelechoski for almost three years,” Holly says, citing work on topics such as child trauma in the juvenile-justice system and child custody as well as policing. It all adds up to confidence that she has made an informed decision about her career and future.